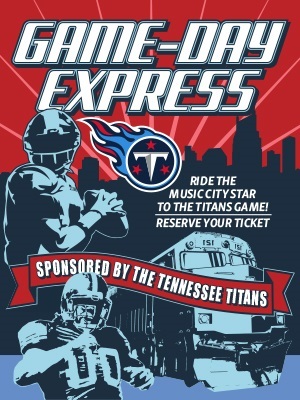 Ride the Game-Day Express to the Tennessee Titans game. Departure schedule below. • Lebanon Station (334 W Baddour Pkwy.) at 10:00 a.m.
• Hamilton Springs Station (1000 Gaston Drive.) at 10:07 a.m.
• Martha Station (65 Martha Circle) at 10:15 a.m.
• Mt. Juliet (22 E. Division St.) at 10:25 a.m.
• Hermitage (4121 Andrew Jackson Pkwy.) at 10:35 a.m.
• Donelson (2705 Lebanon Pike) at 10:45 a.m.
• Arrive at Riverfront Station at 11:00 a.m. The return train will depart Riverfront Station 45 minutes after the game ends and stop at all the stations. Parking is free at the outlying stations and is not available at Riverfront Station.